Am very happy recipient of a CD that turned up recently. 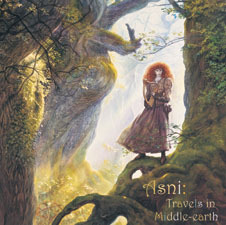 New Zealand harper Asni's album Travels in Middle-Earth is just out. Now there is no shortage of Middle-Earth-inspired music, but this is the top of the pick. Middle-Earth is the stage for a solid exploration of a real variety of themes with the harp - original, traditional, folk, modern. Buy it, not only will you be helping out an artist who has the courage to self-produce without any compromises what she believes in, it really is lovely. In fact, pick up her other CD 700 Years of Pop, which is truly delightful. ***Okay, so I stole that from the debut album of Pink Floyd. I arrived back in New Zealand two days ago and got the CD at the marina office yesterday, listened to it last evening on deck through cockpit speakers. It is great, as is the entire production: liner notes—if that is what they are still called, photographs, illustrations. - I carry my music from one side of the world to another in iPods I imported your CD this morning, including taking a photo of the cover illustration art work. About half my music is classical and half other, mostly what could be called 'world'. Your's is the only harp music. You have a unique talent and sound, and I'm very glad that I happened to hear you one day on Radio New Zealand. I have played my copy and I really like your music; very atmospheric and melodic. I constantly play Tolkienian music in my shop and your cd's will certainly be one of them with others like the Howard Shore complete soundtracks, The Tolkien Ensemble, Lingalad and Glass Hammer. Dear Asni - I wanted to write and say how much I love listening to your CD. I like your settings of the LOTR film music, especially 'Evenstar'. … The mix of music and instrument styles is good. Being a musicologist & musician's daughter, I can think of many people who would object snootily to putting all these different things (film music, folk, classical etc) on one CD but I never saw any reason for such narrow-minded purism, especially since you've done it so well here. So yeah, I'm very glad you made this CD! The texts inside about the various harps of Middle-earth are great too. Just to finish things off nicely, here's what my sister just e-mailed : "I also got the lovely Asni CD, thank you so much! I think it is lovely. I have put it on my ipod and listen to it on the train, wishing I were in Middle-earth..." (She's a Tolkien/Fantasy literature specialist and much more knowledgable about Middle-earth (and early music, come to think of it) than I. Many thanks for the CD! Listening to it is great pleasure, especially that being ill now I have lots of time to explore your music. The pieces on the CD really evoke memories of Valinor, Beleriand, Rivendell... Many thanks for your beautiful music! I enjoyed it very much - thank you for something that fills a spot where the vast amount of nonsense that passes for music these days can't. Thank you. .... whoauuuuu , what a beautifull sound ! pure sound ! i was afraid to listen an entire complete music with harp ...and the resultat is very excellent ! wonderful beautiful moment, the journey is superb…. Many thanks. It is excellent, beautiful music. I just wanted to let you know how much I have enjoyed your CD. The harp is truly a wonderful instrument with a lot of possibilities, at least that's the impression I have. Now that the Peter Jackson film craze (and the deluge of music triggered by it) has subsided somewhat, more thoughtful and sustained interpretations of Tolkien's world are beginning to emerge. One recently recorded specimen is German-born/New Zealand-based harpist and musicologist, Asni's, soon-to-be-released Travels in Middle-earth. A medley of original compositions, arrangements of early music and folk melodies, and renditions of Howard Shore, Travels comprises twenty-five vignettes grouped around thematic headings such as "Rivendell," "Into Darkness" and "Echoes of Beleriand." Accented by recordings of nature sounds gathered during visits to various NZ film locations, and adorned with handsome artwork by John Howe, Asni has delivered the Tolkien music aficionado an elegant evocation of Middle-earth. A Middle-earth album inhabited predominantly by traditional rather than original pieces is likely to arouse suspicion from some quarters, and even provoke dismissal as "false advertising." And to be sure, since 2001 there have been plenty of self-proclaimed "Tolkien-inspired" CDs that turn out to be anything but. Travels, however, is not one of these. On the contrary, Asni has selected a repertoire that effectively captures the same sense of an "imagined past" that grounds Tolkien's legendarium. The richness of this repertoire lies not only in its stylistic diversity, but also in its cultural breadth, drawing inspiration from Spain and Estonia no less than England and Ireland (not to mention New Zealand and Gambia). Most welcome to this reviewer's ear is Asni's ability to include Celtic themes without allowing them to dominate the album. This musical journey spans the whole of Middle-earth, not just one corner of it. … In my opinion, Asni's translations of Shore from an orchestral to a solo harp idiom - in the context of the larger tapestry she has woven - actually achieves this sense of arresting distance better than Shore. Or maybe it's just that Shore has become too familiar after the umpteenth listen. - Kudos to Asni.